So, what’s up with Breitbart’s downward-trending traffic? It’s fallen off a cliff over the last three months. The popular and influential conservative website has been solidly entrenched as the second-most-trafficked right-wing website since I began tracking this data beginning in September 2017 for my website TheRighting. And it still ranks as #2, according to my latest top 20 chart of conservative websites. But if traffic continues to plummet at this precipitous rate, it won’t rank second for long. Those are the worst numbers for any of the consistently ranked top 20 conservative websites that I’ve monitored in that period, although Newsmax, which draws about a third of Breitbart’s traffic, also had a lousy three-month streak. (December numbers will be available at the end of January.). In September, only TheBlaze came close in negative numbers, with a decline of 27% in unique visitors. Generally, conservative websites generated strong numbers in September and were probably boosted by the Judge Kavanaugh hearing and the publication of Bob Woodward’s headline-grabbing Trump book. Major mainstream news sites stumbled in September (The New York Times, -14%; The Washington Post, -10%; CNN, -8%), but there were no dramatic decreases. In October, Infowars uniques sagged 66%, although it must be noted that the controversial site’s traffic rocketed 84% in September. And uniques to Hannity.com plunged 49% in October. Part of the reason for those declines could be attributed to a falloff from an extra-robust October 2017 news environment, which saw the mass shootings in Las Vegas and a terrorist incident in lower Manhattan where pedestrians were mowed down. Of course, in October 2018, there were the murders at the Pittsburgh synagogue, but perhaps news consumers are being hardened by these developments and not rushing to news websites so frequently for analysis and the latest developments. Meanwhile, The Washington Examiner and The Washington Times are coming on strong and may even rival Breitbart for the influential slot as the second most-trafficked conservative website. The Washington Examiner (owned by Clarity Media, which shuttered The Weekly Standard last month) has posted three straight months of increases in unique audience visits and now sits a little more than one million unique visitors behind Breitbart. The Washington Times, which recorded two huge months of audience gains in October and November, ranks as the fourth most-trafficked conservative website, about 1.7 million unique visitors behind Breitbart. Fox News, as usual, completely overshadows all other conservative websites, routinely attracting about ten times the unique visitors as Breitbart: almost 90 million in November, when it posted a 2% gain, or 1.8 million uniques. 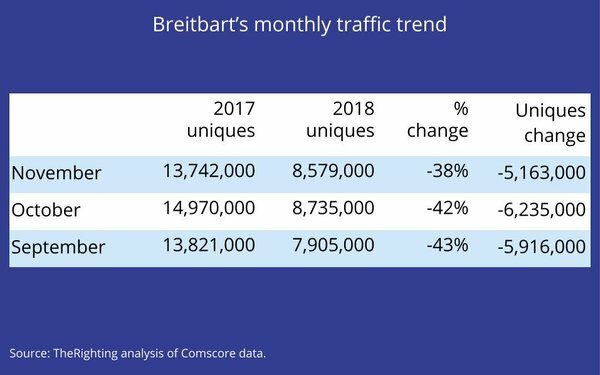 So what’s causing Breitbart’s traffic plunge? It’s hard to tell. While I visit the site every weekday, I’m not going to speculate at this time. I reached out to Breitbart for comment but there was no response. Meanwhile, it’s fair to wonder if the slump is a blip in an otherwise successful run — or a darker new reality facing the right-wing website.